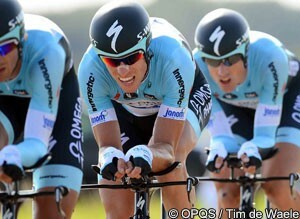 The Omega Pharma-Quick Step team of Tom Boonen, Sylvain Chavanel, Tony Martin, Niki Terpstra, Kristof Vandewalle and Peter Velits, won the inaugural team time trial World championships for trade teams in the Limburg town of Valkenberg. The Belgian team, finishing with all six of its riders - despite the presence of the tough climb of the Cauberg coming just 1.7km from the line - setting a time of one hour, three minutes and 17 seconds, to go more than minute quicker than the then leading team of Liquigas-Cannondale. "Together with [Tom] Steels and [Jan] Schaffrath we did a great job in the last days," said Omega Pharma-Quick Step directeur sportif Wilfried Peeters. "A few months ago we did the first recon and we recorded everything for our riders. Then we came here again after Eneco Tour with the riders and we did the course. Then in the last days we really put everything into preparing as best as we can this race. Tom Steels put really a lot of energy into it and everything went well. It was a great team effort even on the staff side. Mechanics, masseurs, everybody on the team has to be proud of it and feel as if they are a part of this great victory." Having been far less smooth on the Cauberg than their rivals, BMC Racing finished with just four riders - with Alessandro Ballan, Philippe Gilbert, Taylor Phinney and Tejay van Garderen having left Marco Pinotti and Manuel Quinziato behind at the bottom - and crossed the line an agonising three seconds slower than Omega Pharma-Quick Step after being close at all the preceding checkpoints. "This hurts a little bit, especially since it's a world championship," said BMC Racing Team president and general manager Jim Ochowicz. "It was something we prepared well for obviously, with the results you saw. “But it's a good start to the week for the team,” he added. “So we have a lot more to look forward to." The Orica-GreenEdge team - of Sam Bewley, Luke Durbridge, Sebastian Langeveld, Cameron Meyer, Jens Mouris and Svein Tuft - was the next, and penultimate, team to finish. Having been a little slower than Omega Pharma-Quick Step at the first checkpoint, and slipping further back as the course went on, finished 47 seconds behind the Belgian team to take the bronze medal and push Liquigas-Cannondale off the podium. "The boys were happy to earn a medal, but we came here to win," said Orica-GreenEdge directeur sportif Matt White. "We weren't good enough to take the win on the day. We gave it everything and executed our plan well, but two teams went faster." MTN-Qhubeka was the team to get the race under way and the ambitious South African team posted a finishing time of 1hr 06’55”, which was to last until Itera-Katusha lowered the mark to 1hr 06’26” four teams later. The Russian Continental team was to sit on top of the standings for some time, until the first of the 18 WorldTour teams finished, and Euskaltel-Euskadi posted 1hr 05’48”. The Basque team was not even able to take its place on the hot seat however, before AG2R La Mondiale went five seconds quicker, but the French team was immediately knocked off the top in turn, as RusVelo went faster still with 1hr 05’31”. Meanwhile, out on the course, Rabobank was enjoying the homefield advantage of competing on Dutch roads, and went through the first 11.9km checkpoint in the best time so far of 14’05.16”. This was matched exactly by Omega Pharma-Quick Step three teams later - to the hundredth of a second - with the Belgian team clearly meaning business. Orica-GreenEdge was less than a second and a half slower at that point, while BMC Racing was only fractionally slower still, as the top four teams could be split by less than two seconds at almost a quarter distance. Rabobank was quickest again at the second checkpoint, after 21.6km, with 25’57”, but Omega Pharma-Quick Step had gone faster in the second sector and went through in 25’49”. In the final sector, six Liquigas-Cannondale riders hit the foot of the Cauberg, but only the four fastest were still together at the top and those riders were soon sprinting to the line to cross in 1hr 04’21”. Rabobank appeared to be fading a little however, having lost Wilco Kelderman, and was less than three seconds faster than the time that the green and blue team had set at the third checkpoint after 37.2km as it went through in 45’53”. Omega Pharma-Quick Step went through the third checkpoint in 45’08”, more than 44 seconds quicker than Rabobank, while BMC Racing had moved into second, just eight seconds slower than the Belgian team as the final climb approached. The four remaining members of the Rabobank team disintegrated on the Cauberg as Stef Clement went to quickly and blew Luis León Sánchez out the back; the local team managed to reform at the top and sprinted to the finish, but were three seconds slower than Liquigas-Cannondale as they crossed the line. Unlike Rabobank, six Omega Pharma-Quick Step riders made it up the climb together and, with Classics King Boonen and World champion Martin driving to the line, the Belgian team finished in 1hr 03’17” more than a minute faster. Having powered to the foot of the Cauberg - burning out Pinotti and Quinziato - the four remaining men of BMC Racing suffered a similar fate to Rabobank however. Phinney was struggling as van Garderen and Gilbert drove up the climb and, having reformed, the American-registered team sprinted to the finish to cross the line just three seconds slower than Omega Pharma-Quick Step to go into provisional silver medal position. Orica-GreenEdge, having been close to the leaders for most of the course, held it together on the Cauberg and crossed the line 47 seconds outside the time of Omega Pharma-Quick Step; slotting into the bronze medal position with only Team Sky to come. Team Sky had started last but, despite its top seeded position, many of its top riders were riding the team’s home race at the Tour of Britain - and preparing to deliver Mark Cavendish to his final victory in the rainbow jersey - and so slumped to a disappointing ninth.